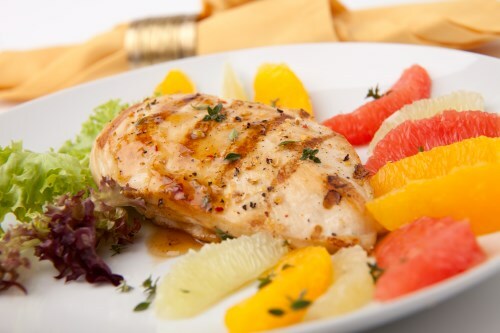 Place chicken into a roasting pan, and squeeze the juice from the grapefruit halves all over and inside the chicken. Drizzle chicken with extra virgin coconut oil, and sprinkle with seasoned salt. Cover with aluminum foil. Bake in the preheated oven, covered, for 45 minutes; remove foil, and bake until meat is no longer pink at the bone and the juices run clear, about 15 more minutes. An instant-read thermometer inserted into the thickest part of the thigh, near the bone should read 180 degrees F (82 degrees C). Remove the chicken from the oven, cover with a doubled sheet of aluminum foil, and allow to rest in a warm area for 10 minutes before slicing.